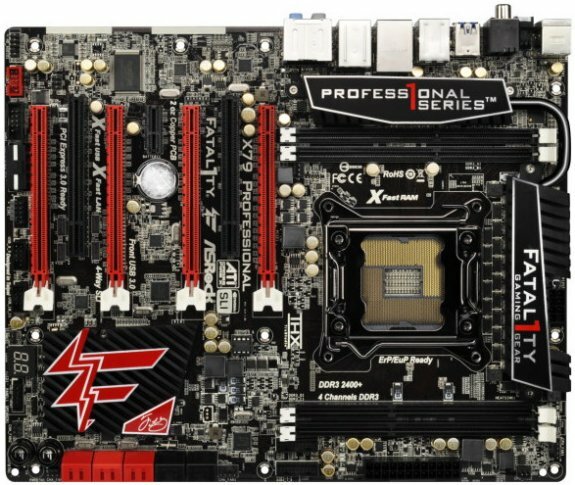 Details and photos of the ASRock Fatal1ty X79 Professional motherboard were published over at TechPowerUp. This LGA2011 model offers a 2oz copper PCB design, Premium Gold Caps, four PCIe 3.0 x16 slots, ten SATA ports (six 6Gbps?) and four DDR3-2400 memory slots. Pricing and availability is still unknown. ASRock's latest Fatal1ty offering also comes with one PCIe x1 and two PCI slots, six USB 3.0 ports (four on the back plate, two more via a header), a debug LED, 7.1 channel audio, two eSATA connectors, one Fatal1ty mouse port (USB 2.0, allows users to set the mouse polling rate to 500 Hz), Gigabit Ethernet, a FireWire port, and a Clear CMOS button. Moreover, the board has UEFI BIOS, extras like the XFast USB and XFast LAN technologies, and is bundled with a 3.5-inch I/O panel providing two USB 3.0 ports.